An elite category is available for swimmers who register online to nominate (Male and Female). The winners (Male and Female) of this Elite category will win the Anita Comelli Trophy. Winners of the Anita Cormelli Trophy are not eligible for an age group win, all others will be eligible for an age group place in their relevant age group. Registration is between 8:30 am and 9:30 am near the Rotunda (near cnr The Esplanade & Mandalong Rd). Please get there early to avoid delays. All swimmers entered online need to bring some form of ID to pick up their race packs near the Rotunda. On the day entries close 30 minutes before each event starts. Cash and credit card payments (no Amex). 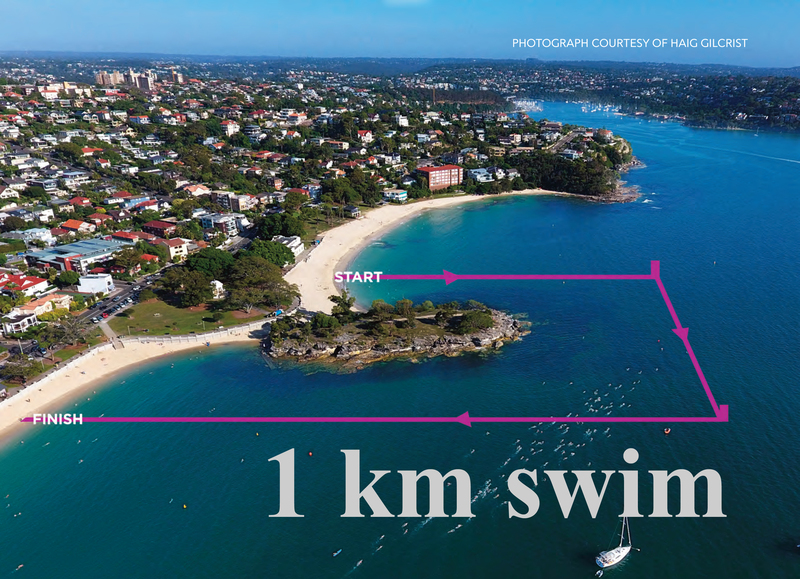 Fundraise more than $200 on the Balmoral Swim Fundraising platform by 8 pm on the Saturday before the race as an individual and you can earn free entry to the 1km Balmoral Swim. See here for how to claim free entry. Join the fight to help beat childhood cancer by getting people to sponsor you online. Go to the Fundraiser page now and set up your own personal fundraising page. There will be a bag drop tent located on the grass next to the Rotunda open from 7:15am – 10:30am. You will be required to fill out a bag sticker with your details (name and swim number) and attach it to your bag for minding. Please note the event will take care of your belongings, but no responsibility will be taken for valuables or clothing that are lost or damaged. Toilets are located at the north, south and centre of Balmoral Beach at Bathers Pavilion, Balmoral Baths and the Bus shed. This year you can look forward to fun and entertainment for the whole family. There is plenty to choose from entertainment, food, and warm down zones & more. Balmoral Beach also has some great cafes and coffee shops and places to picnic so stay around after the event and enjoy beautiful Balmoral. All the results will be posted online later in the day. The presentation of prizes to all 1km winners and place getters will also take place on the day of the event at 12 pm. Prizes will not be posted out if you are not there to claim your prize. On the day, don't forget to use the hashtag below and @ us throughout the day on Facebook and Instagram. To get to Balmoral you can catch a 257 bus from Chatswood or a 238 bus from Taronga zoo. For more information visit Sydney buses info. There is also a free shuttle bus organized for the Balmoral swim which passes a number of bus stops and parking. For more information see the shuttle bus map. Balmoral Beach provides metered parking on the Esplanade and 2 hr parking on Awaba, Waitovu and Hunter streets. You can nominate to swim in an Elite category when you register online. The winning Male and Female of the Elite category will win the Anita Comelli Trophy. Numbers in the Elite category are restricted, The Balmoral Swim organisers reserve the right to determine who will be part of the Elite wave. Any entrants that nominated for the Elite category but are not selected to be part of the Elite wave will be allocated to the relevant age group wave. Winners of the Anita Cormelli Trophy are not eligible for an age group win, all others will be eligible for an age group place in their relevant age group.